Thousands of fans lined the streets of Seattle on Tuesday to celebrate the Sounders' MLS championship. 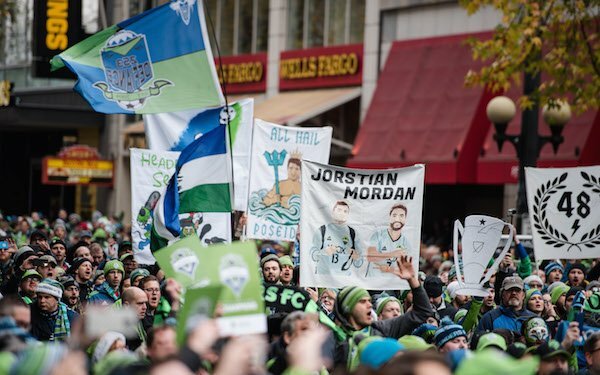 It culminated with a rally at Seattle Center, not far from Memorial Stadium, where it all began in 1974 with the Sounders' debut pro season. Photos: Jane Gershovich, courtesy of Sounders FC Communications. Sounders coach Brian Schmetzer was one of those young fans who followed the 1974 Sounders with players like Jimmy Gabriel and Dave Gillett, who stayed in the community and supported soccer during the lean years between the NASL's demise, through the A-League and USL years and into the Sounders' arrival in MLS in 2009. 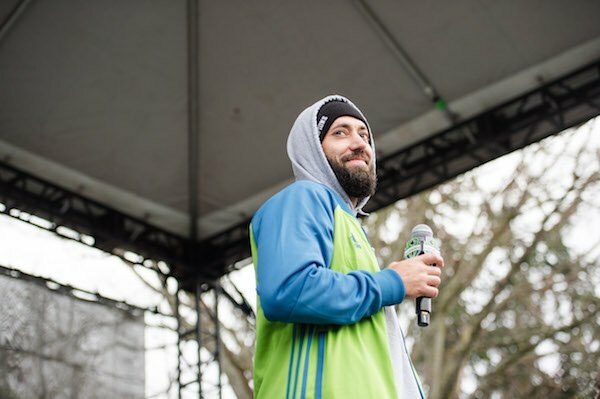 "Lots of people have stayed in the community," said Schmetzer, "and they're part of the fabric of the community, so that's very important." Schmetzer, who played for the NASL Sounders, said it was natural for him to jump off the trolley and mingle with the fans. "I'm a friendly guy," he said. "I like conversation." Thirty-six years after Schmetzer made his pro debut, another local product, Jordan Morris, was the MLS Rookie of the Year and helped the Sounders win their first MLS title. Morris, who grew up in nearby Mercer Island, said the support was more than he could have ever imagined. 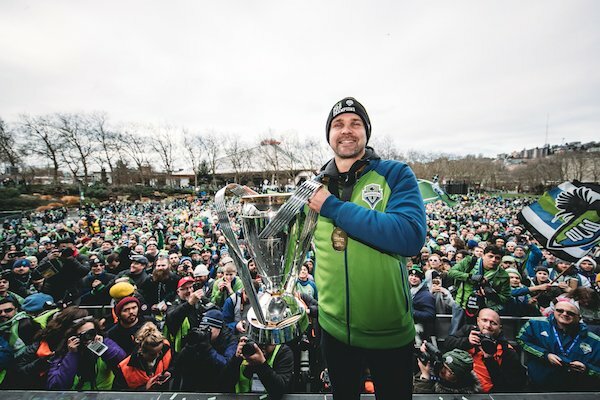 2 comments about "Photos: Sounders' parade ends where it all began". Quarterback TD, December 14, 2016 at 8:13 a.m. Some day some time there will be a JETS, Red Bulls, Mets, NYCFC, Knicks and Nets Canyon of Champions celebration parade... but not anytime soon but luckily we have Giants, Rangers and Yankees who keep our parade route busy.. Congrats Seattle and enjoy while it last because you definitely will not be celebrating another championship anytime soon with that team and play style..
John Soares, December 14, 2016 at 1:04 p.m.